With input from two Nobel laureates, the curators of an innovative art exhibition in New York state are spotlighting the 10 molecules of the 20th century that have most profoundly altered our world. "Molecules That Matter" features giant models of these elite compounds--ranging from aspirin and penicillin to DDT and Prozac--juxtaposed with contemporary works by nationally recognized artists. UCSC assistant professor of art Melissa Gwyn has contributed four paintings to this unusual exhibition at Skidmore College's Tang Museum. For the past two decades, Gwyn has been creating art inspired by science. Her paintings combine the thick paint of abstract expressionism with the delicate and intricate detail of Dutch 17th-century still life. Gwyn's oil-encrusted works can take months and even years to dry. She begins each one by pouring puddles of paint onto wood panels and molding the paint with her fingers, scalpels, and tweezers. Eventually, in a labor-intensive process that calls for multiple layers of paint, organic shapes resembling flowers, fruit, and leaves begin to appear and multiply. 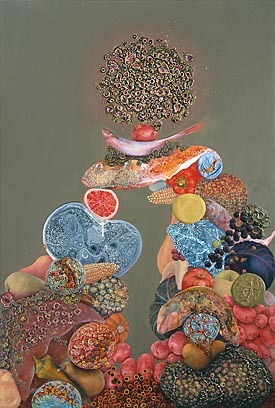 Artforum magazine noted that her paintings "look like enlarged slides of microscopic organisms whose apparent simplicity is belied, under closer scrutiny, by their teeming busyness." The co-curators of the "Molecules That Matter" exhibit--the Tang museum's director and a Skidmore chemistry professor--took note of Gwyn's early work dealing with chemistry and selected her 1992 drawing of the hormone progesterone for the show. In addition to including that piece in the exhibition, they invited her to create new works to represent three other featured molecules: DDT, Prozac, and the recently discovered carbon structure, Buckminsterfullerine. "In my paintings, I draw inspiration from scientific imaging and science illustration sources," says Gwyn. "The paintings also reflect my research into each molecule's impact--both positive and negative--while incorporating my ongoing interest in the environment and its degradation." Gwyn's creative approach generated paintings that blend depictions of MRI scans and digital modeling of human anatomy with traditional still-life forms. "The DDT painting, for example, combines repetitive patterns of red blood cells, parasites in those cells, and images of the Colorado potato beetle, because the pesticide DDT became the focus of a campaign to eradicate the beetle," says Gwyn. 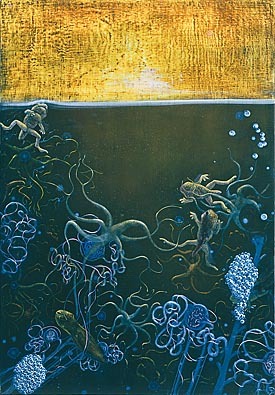 Her Prozac painting focuses on a lesser known environmental impact of the pill's popularity. "In researching Prozac, I came upon a study that found there is so much Prozac in the culture that it's ending up in wastewater, with the result that it may be affecting fish and frog populations and altering their reproductive cycles. So I created a surrealistic, fantastic pond-like site where frogs--an indicator species--are swimming among algae and seaweed that resemble human neurons and nephrons (the kidney filtration system)--as their realities and ours are intertwined." Most of the pieces in the "Molecules That Matter" exhibition were culled from existing art; in fact, Gwyn is the only artist from whom the curators sought new work. She devoted seven months to the three new paintings, completing them this past August. 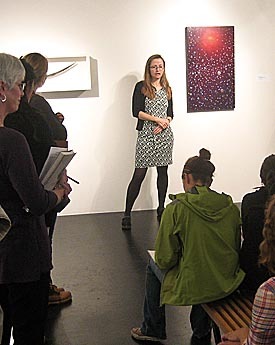 Gwyn attended the exhibit opening a month later and spent time meeting with Skidmore College students in organic chemistry, art theory, and painting classes. She also participated in public panels along with the curators, scientists, a historian, and another artist to discuss the art/science collaboration. Gwyn's fascination with art and science was originally inspired by elementary school science books and the children's science fairs that she encountered in the public school systems of New York, where she worked part time in the early 1990s after graduating from Yale with an M.F.A. in painting. "I was quite taken with the way that children's creativity interpreted the symbols of atoms in molecular models," notes Gwyn. "Kids created brilliant models of graphite with gumdrops and toothpicks; another molecule was represented by aggregates of colored gym socks. Inspired by these sculptures, I began to build molecular models out of plastic fruit and then depicted the models in still-life paintings." Gwyn's participation in "Molecules That Matter" has already sparked new interest in her art; her work has been noted in several reviews of the exhibit, including one featured in the December issue of the magazine Chemistry World. "The great benefit of artists working with scientists is finding shared vocabulary and experiences," observes Gwyn. "When people in different disciplines reveal their ideas, processes, and failures, it brings more dimensionality to a subject." "The Tang exhibit is a perfect example of this," she adds. 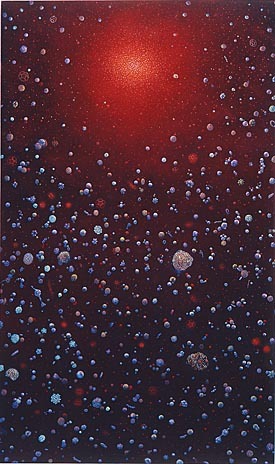 "The functionality of having these seemingly invisible molecules exhibited at a scale even larger than the viewers themselves is a fascinating reversal of focus. It brings to light the huge impact that these molecules have on our lives." The "Molecules That Matter" exhibit runs through April 13 at the Tang Museum, before traveling to several other college campuses across the country.